If you want to see the future, look somewhere else. The Samsung Galaxy S8 is basically perfect. It has everything you could ever want in a phone: a crystal clear 5.8-inch display, waterproof body, and a futuristic camera. It’s also incredibly boring. The problem is, our phones are already sleek black slabs with crystal-clear screens and high-definition cameras. Seven years ago, new features on a phone mattered, but now we’ve reached a plateau, and even a dream machine like the Galaxy S8 is pretty much just an uninspiring upgrade to whatever device you’re reading this article on. When the iPhone 4 launched in 2010, it added a camera flash, a front-facing camera for video calls, a screen with double the resolution, a glass and aluminum design, a gyroscope that enabled smooth augmented reality apps, and double the storage of its predecessor. In the beginning of the decade, every new model changed the way we used our phones (think Snapchat would have ever become a thing without a selfie camera?) as the smartphone era came of age. Now, every top of the line phone shoots 4K video. They all measure steps, map out routes, and can answer most questions you ask them out loud. That leaves phone makers with two choices: refine the existing feature set, or come up with new features. The S8 does an admirable task of trying both of these things, but even features that are marketed as game-changers aren’t really all that interesting. Samsung DeX is cool, but it's a few years too late. 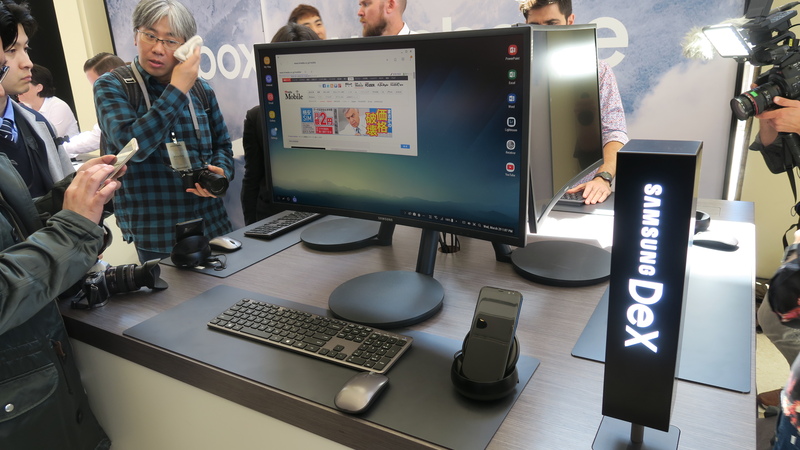 Samsung DeX, for example, lets S8 users dock their phone and attach a monitor, keyboard, and mouse. This would have been cool a few years ago, but laptops and tablets are so thin that people already carry computers if they need them (nobody carries a keyboard, mouse, or monitor). And since everything you do on a mobile device is usually saved into a linked cloud service, opening it up on a larger screen is as easy as just switching to your computer. Docking a phone to a larger screen would make sense if the phone was some treasure trove of unique information, but tech giants have successfully blurred the lines between devices and the cloud to the point that it seems senseless. Microsoft launched a similar feature for its Windows phones in October 2015, and it still wasn’t enough to save the platform from sliding into obscurity. Samsung Gear VR in action. Most of the major device makers, including Samsung, see Virtual and Augmented Reality as the next frontier for phones, but aren’t sure quite what to do with it yet. Samsung’s Gear VR headset offers an experience that seems to offer neither the affordability of Google Cardboard (which is basically free) nor the optimized experience of the Oculus (multiple screens, a 90Hz refresh rate, etc.). Until virtual reality moves beyond funny tech demos and into serious productivity or social apps, it’s not clear that people will be demanding that their smartphone supports VR. Rather, the smartphone might go the way of the desktop computer, transitioning into a hub connecting other portable smart devices like watches and glasses. Right now, the S8 is the final symbol of an industry that’s reached a plateau. It makes us yawn, but the future it enables could make us gasp.